They say that things rarely go as planned, and I think that especially applies if you are talking about a 1 year old baby and her birthday. On Sunday we had Selah's 1st birthday party (Dohl in Korean) and although it was a really fun and blessed time with our own family as well as our church family, it was also pretty hectic! Since we had Father's Day going on as well, Selah had just about had enough of the festivities and cried towards the end of the event. For the most part, though, I feel like it was a success because it never seems to be easy for baby anyway (at least not in a Dohl)! And as long as we got to share this special occasion with everyone we love while getting some pictures along the way, I would say it was a success. Here Selah is wearing an old Korean attire called hanbok, and it is tradition to wear it whenever there is a special taking place. You might have already seen such types of weddings...but usually the mother of the bride honors their Korean roots and the bride's special day by donning on this dress. Initially I wasn't going to go this route for Selah's birthday, but when I realized that my parents really wanted to see her in it, I was wooed by the thought of how adorable she would look. I guess I wanted to go big or go home, hah! And I also wanted to make this day extra special for my parents. What you see above is called a Dohljabi (doh-jah-bee), and it is a tradition that has been around for a looooong time! Don't ask me how long though, because I don't know the details. ;) It originally used to be a fortune telling ritual in which the baby would have to reach for one of the items laid in front of him or her. 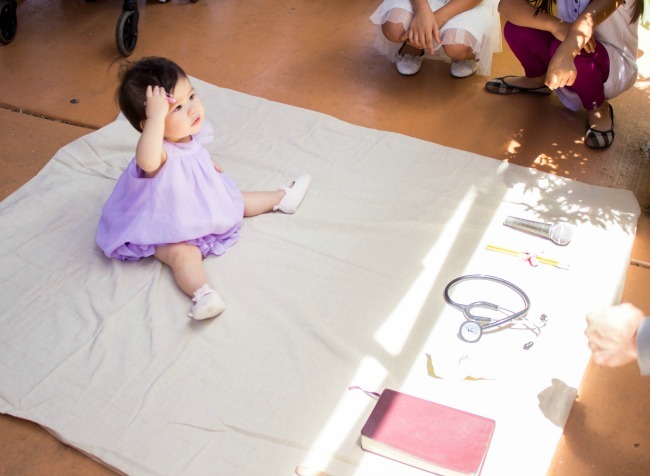 Whatever the baby grabs or touches first is what she will become (ex: stethoscope=doctor). Thankfully that superstitious significance has no meaning for most of us in this generation, and nowadays we just do it for the laughs. I mean, imagine how cute it is to watch a baby grab her favorite item and everyone roaring up in laughter! And here's a special shoutout to my dearest Susan--thank you tonnnnssss for helping me set everything up! Seriously could not have done it without you. On Saturday Selah had her first haircut at Pia Hair Salon in Torrance. They did an amazing job and thankfully Selah was as cool as a cucumber. Phew! My tip is to get the sweetest stylist you can find because babies sense the benevolence of a person. I also took her favorite snacks to keep her busy so she wouldn't turn her head so abruptly. 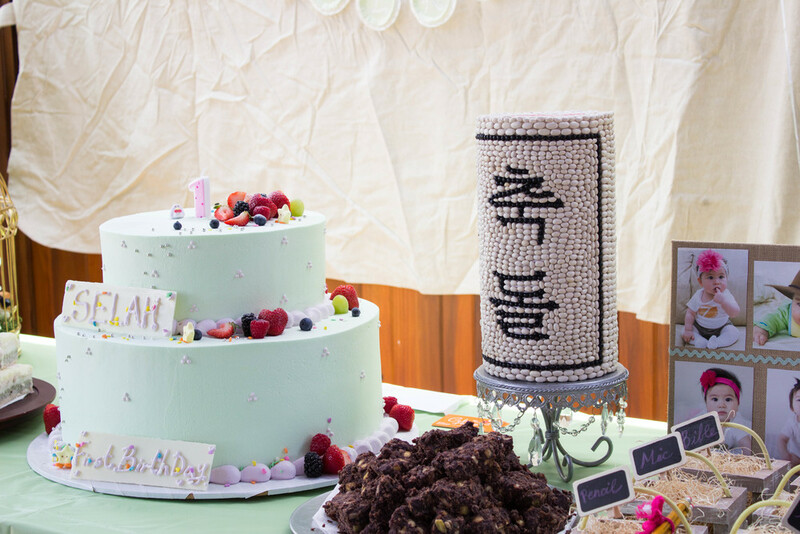 How do you envision your little one's party? Or how did you choose to celebrate? What are some traditions that are unique to your culture, or even your family?